A new study has been published which has highlighted an increasingly common finding in the dental office: a correlation between certain teeth defects and celiac disease. The study showed 85% of adults with celiac disease had specific tooth enamel defects attributable to gluten consumption while the adult teeth were forming. Unfortunately, very few dentists are aware of this correlation and the steps necessary to help dental patients with celiac disease. Drs. Nicholas and Carla Calcaterra in our Orange, CT dental office are committed to informing and educating patients about this link. 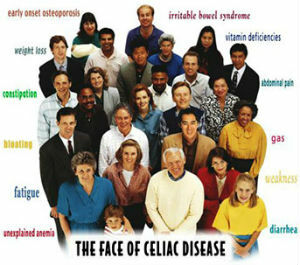 Celiac disease is an inherited condition which affects an individual’s ability to digest gluten. Gluten is the common name given to proteins found in all types of wheat. When a person with this condition consumes gluten, the immune system creates a toxic reaction that damages the small intestine. In the United States, nearly 1 in 100 whites have celiac disease. Problems or defects in dental enamel (enamel is the outermost layer of the tooth). Apthous ulcers (also called canker sores or mouth sores). Defects in dental enamel are the most troubling for patients, as they weaken the teeth and make them more susceptible to dental decay (also referred to as cavities). In order for the defects to occur, you must have consumed gluten while the permanent teeth were developing, which is from birth to age 7 to 8. Upper canine tooth on an adult patient from Milford, CT with celiac disease. Photo Dr. Nicholas Calcaterra. The exact mechanism of how the defects occur is unknown, but researchers in this paper believe it is an immune-mediated reaction. 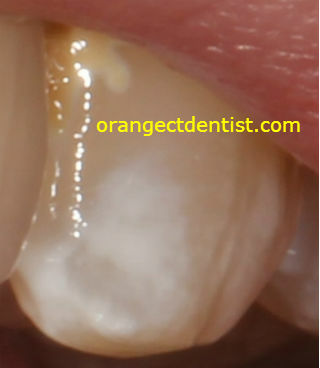 The photograph here shows enamel defects in an upper canine in a patient from Milford, CT. She was seen by Dr. Nicholas Calcaterra in our office in Orange, CT. A thorough medical and dental history as well as a detailed clinical exam allowed for Dr. Calcaterra to determine the origin of the defects. To address this tooth and other ones with similar features, Dr. Calcaterra placed several all porcelain crowns. If you have celiac disease, ask your dentist if she/he sees any clinical or radiographic enamel defects. Be aware that if you have defects, you are at higher risk for dental decay. Ask your dentist for a high fluoride prescription toothpaste such as Prevident. If you suffer from chronic apthous ulcers, ask your dentist for a prescription that can relieve the pain and potentially shorten the duration. Kenalog in Orabase is a common one. If you have celiac disease, ask your dentist or hygienist to use gluten-free paste at your 6 month cleaning appointment. We have this available for all patients upon request. If you have not been diagnosed with Celiac disease, but have dental findings similar to what is described AND you have gastrointestinal symptoms, consult your physician. If you live in Orange, Woodbridge, Milford, or other area towns and would like a consult or new patient appointment with Dr. Nicholas or Carla Calcaterra, call us at (203) 799 – 2929 or visit our appointment page. Or if you would like to learn more about how we offer gluten free dentistry, visit this page.